Ploughe’s mom explained that the diagnosis of cancer in a teenager is something that affects the entire family, not just the patient. The cancer was diagnosed towards the end of the boys basketball season, meaning Ploughe would start her fight at about the same time the boys basketball team was starting its fight for a sectional crown. “It really affected our team; there were a lot of tears,” said Kokomo cheerleading coach Kelly Karickhoff. “It is a learning experience when something like this happens to your team. There were a lot of questions and concerns from her teammates. “I am glad we found it and caught it early,” are words that Hicks will always cherish. If not for an early diagnosis, this story could have had a different ending. Ploughe’s mom said it was a routine checkup that ended up saving her daughter’s life. Western High School girls softball coach Jim Clouse was thrilled with Ashley’s prognosis and understands what she went through. A cancer survivor himself, Clouse said her checkups should only last for about five years. Clouse, whose mother is currently fighting cancer, beat the dreaded disease and remembers exactly what he thought when the doctor sat him down with the diagnosis. 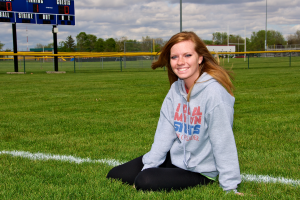 “It’s wonderful that the word cancer is not an absolute death sentence like it used to be,” added Kokomo softball coach Lisa Tate. Ploughe explained that after a surgery in which doctors removed her cancer-riddled cervix, she had two things on her mind – softball and cheerleading. She said she wanted to get back to the softball field this spring and to competitive cheerleading this summer – especially after being named a Wildkat varsity cheerleader for next school year. Hicks said that her daughter was in extreme pain from the cancer and subsequent surgery – something no mother should have to watch in her child. As soon as the doctors released her for physical activity, Ploughe said she started working out for the softball season. Ploughe was diagnosed with cancer 13 months after another Kokomo Lady Wildkat was stricken. On Dec. 17, 2010, Kokomo swimmer Morgan Brantley was diagnosed with ovarian cancer. But unlike Ploughe, Brantley’s fight proved to be costly as the young 17 year-old Wildkat lost her battle three months later. Ploughe’s battle with cancer reminded many Red and Blue faithful of Brantley’s fight. The Kokomo High School cheerleaders helped lead a fundraiser during Brantley’s battle against cancer. Kats for a Kure, which was spearheaded by the Wildkat cheerleaders and involved the Kokomo student body, raised thousands of dollars to help the family during its time of need. Tate agreed with Karickhoff, noting how hard it is for students to comprehend a deadly disease at such a young age. And now, after pushing her body to the limits, the hard work has paid off. A little more than three months after being diagnosed with cancer, Ploughe is scheduled to return to game action no-later-than the Kokomo at Western game on April 30 – which also happens to be the Cancer Awareness Game between the two local rivals. Tate and Clouse said since both teams have been touched by cancer, it was a great fit to help a cause while they battle on the softball field. The teams had special T-shirts made and have been selling them as a fundraiser. Tate said they chose the color lavender for the fundraising shirts as that color represents all cancers. In addition, Western will donate one dollar from every ticket sold at the gate and the Panther Pride Booster Club is donating all proceeds from that nights concession stand. The American Cancer Society will be the recipient of all donations, and they will be at the awareness game and will have a booth set up to distribute information. After the game, both teams will sit down and share a meal as one final sign of unity – and Ploughe will be in the middle of that huddle as a cancer survivor. Now that Ashley Ploughe has stared cancer in the face and won, the now 16 year-old Lady Wildkat looks back on her ordeal and can take a deep breath. But she also understands what could have happened if her cancer wasn’t caught in time. And Wildkat Nation is grateful that they are celebrating a young life saved, not another lost. This entry was posted in Kokomo, Lady Kats, Wildkats. Bookmark the permalink.